Join our agents as they open the doors to dozens of beautiful homes for sale throughout the Upstate! Thinking of selling? Contact us to find out how to include your home in this massive event! 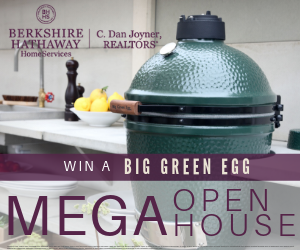 Register* to win a Big Green Egg! Visit www.cdanjoyner.com/mega for participating homes! *Contest runs Sunday, April 28th, 2019 only. The drawing for a large Big Green Egg will take place Monday, April 29, 2019 and the winner will be notified via email. Limit one entry per person. Must be 18 years or older to win. No purchase is necessary to enter or win. Entry to the contest must be done onsite at a participating open house location through Spac.io paperless open house guest registration. Berkshire Hathaway HomeServices C. Dan Joyner, REALTORS employees, agents, affiliates or their family members are ineligible to participate or win. Estimated retail value $890.